Chinese people are marrying Pakistani girls after paying their parents and remove their kidneys. There are a number of reports that the Chinese are marrying Pakistani girls, but now the report has suggested that these people pay the parents of the girls for marrying them and afterward remove their kidneys for their own purpose. Earlier we rarely see the Chinese people in our country but now after the development and progress of the Pak China Economic corridor (CPEC), a large number of the Chinese are here in our country and also start marrying the Pakistani girls. Recently, many young Chinese citizens start liking the Pakistani girls and married to them after paying their parents. The media reports have revealed that the Chinese marrying the girls in order to remove their kidneys. They pay their parents, marry them and then remove their kidneys. This shocking affair was revealed in the National Assembly Standing Committee on Law and Justice by Shunila Ruth. She also revealed that the fake certificates of becoming Muslims by Hindu girls are also being made. The committee meeting also discussed to make the efficient law in relation to the growing domestic violence on women. In the meeting, four member sub-committee has also been set up to enhance the seats in the minorities. It is important to mention here that earlier a Chinese man tried to abduct the Pakistani girl which was made unsuccessful by the immigration authorities. This Chinese man has bought the Pakistani girls, Silvia from Sargodha, from her parents in five Lac rupees, but when the immigration authorities at the airport saw documents and questioned the Chinese he was unable to answer. The girl had told the authorities that her father had sold it to Chinese and she wanted to return home. After which the authorities have made the Chinese men efforts of allegedly abducting a Pakistani girl. 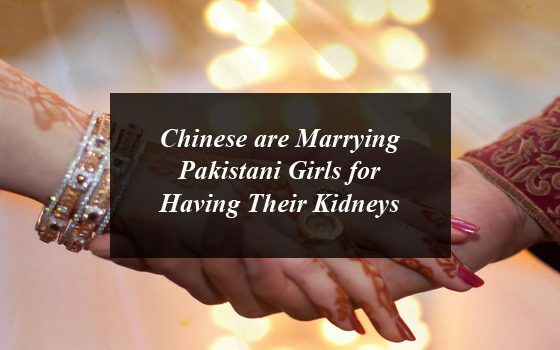 Chinese are Marrying Pakistani Girls for Having Their Kidneys .Chinese people marrying Pakistani girls after paying their parents and remove their kidneys. There are a number of reports that the Chinese are marrying Pakistani girls, but now the report has suggested that these people pay the parents.